Stephen Ong explores all things electronics. I just bought the newly relased Raspberry Pi (RPI) model B+. In comparing the schematic with the older model B, I noticed they have updated the power protection circuit. The circuit functionality is mostly obvious. There is polyswitch F1, a self-resetting fuse which protects the RPI from overcurrent condition. There is the Transient Voltage Suppressor (TVS) diode D5 which protects the RPI against static discharge and possibly overvoltage condition. 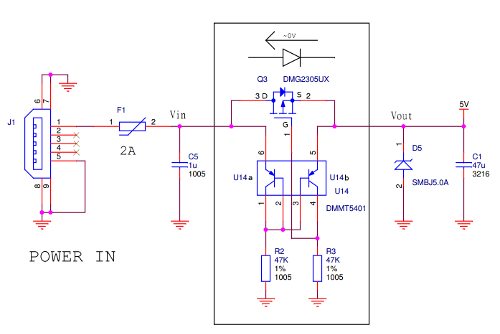 However, the function of mosfet Q3 together with the matched PNP transistors U14 is not so obvious. A mosfet is usually used as a reverse polarity protection, but such protection is not needed for the RPI because of the polarized USB connector used. I wasn’t able to work out the PNP pair functionality by searching the Internet. Adafruit also noticed this transistor pair but did not offer useful explanation. The protection circuit in the RPI model B+ functions as an ideal power diode. This entry was posted in Electronics, RPI and tagged embedded Linux, RPI on July 30, 2014 by stephen. Contribute towards more exciting projects (or coffee fund)! M5Stack review. An Espressif ESP32 development kit.